The Boston Red Sox clinched the World Series at Fenway Park for the first time since 1918, beating the St. Louis Cardinals 6-1 on Wednesday in Game 6 for the franchise’s eighth World Series title and third in the last ten years. Not only did Boston go from the basement to the penthouse after a tumultuous 2012 season, they won the World Series in Boston nearly six months after the tragic Boston Marathon Bombings. Boston’s Shane Victorino cleared the bases with a two-out double in the bottom of the third to give Boston a 3-0 lead. Victorino, the “flyin’ Hawaiian” whose grand slam in Game 6 of the American League Championship Series against the Detroit Tigers sent the Red Sox to the World Series, later singled in another run in the fourth inning and had four RBIs on the night. Stephen Drew led off for the Red Sox in the bottom of the fourth with a home run. Mike Napoli, the converted first baseman who was the catcher for the Texas Rangers when they lost a heartbreaking World Series to the St. Louis Cardinals two years ago, singled in the second run of the inning after Cardinals phenom pitcher Michael Wacha, who had been nearly un-hittable this postseason, had been knocked out of the game. Victorino then singled in the third run of the inning to give the Red Sox a 6-0 lead. St. Louis’s best chance to get back into the game came in the seventh inning. 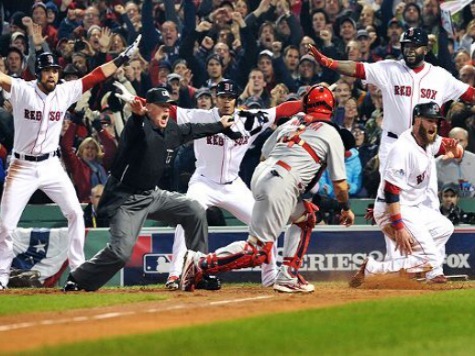 Carlos Beltran drove in St. Louis’s only run of the night, but, with the bases loaded, Allen Craig, playing on an injured leg, hit a hard grounder to first that ended the rally after Junichi Tazawa relieved John Lackey. Lackey, the Game 6 winner, is not unfamiliar with pitching on the grandest of stages–he clinched Game 7 of the World Series for the Anaheim Angels against the San Francisco Giants in 2002. Boston’s Koji Uehara, the lights-out closer, retired the side in order in the bottom of the ninth to begin the festivities. David Ortiz, the designated hitter who was two hits shy of tying the record for most hits in a single World Series, walked four times–three of those were intentional. Carlton Fisk, the Red Sox catcher whose legendary home run in Game 6 of the 1975 World Series against the Reds sent that Series to a Game 7, threw out the first pitch before the game. In 1975, the “Big Red Machine” defeated the Red Sox at Fenway in Game 7, denying Boston fans a chance to celebrate a World Series in Boston. It took 95 years, but Boston fans finally got their opportunity to do so on Wednesday.